Yesterday, Topps announced the final final six cards from their fan voted "Topps 60 Greatest Cards of All-Time" list. Below is a complete look at each and every card from the countdown, from Mike Schmidt at #60 all the way down to the legendary '52 Mantle at #1. The list is filled with plenty of great cards, but at the same time there are some extremely questionable appearances, especially cards like the 1987 Topps Mark McGwire, it feels like there's a few too many steroid guys on the list. It would have also been nice if each player was limited to 1 or 2 appearances. What are your final thoughts on the list? Below are a handful of cards I would have liked to have seen make the list. The title should be changed to the “Top 60 Baseball Cards of all time” cause there is now way that the the 54/55 Topps #8 Gordie Howe doesn’t make this list or a handfull of other hockey cards. Howe about putting together a REAL top 60 card list?? that would be interesting. @ Chris. Love it! That is one of the best cards from any sport of all time. 69 Bench should be on the list. 01 Ichiro definitely should be on the list. I’d like to see 64/65 Phil Niekro on the list also. Also forgot this one 1952 Eddie Mathews. @Ben Barron: Nice call, totally forgot about that one! 1975 Topps Robin Yount deserves to be on this list. There are some really nice cards in the 60, but it would be nice if they cut down the player repeats a little bit. And the Mantle rookie would have more impact as #1 if we were beaten over the head with Mantle in every Topps set. @cardsplitter: I couldn’t agree more, when I see the ’52 Mantle I don’t think of the ’52 Mantle, I think of how many times I’ve gotten a reprint. @cardsplitter The 52 Mantle isn’t his rookie card. I’m surprised the 72 Fisk isn’t in there. Wow. How can 2 cocaine ruined players make the list and Harmon Killebrew’s 1955 Rookie card or his fantastic 1962 Sends One Into Orbit card not??? I guess that old saying is right; Nice Guys Finish Last! Get Well Harmon. You can beat the cancer! Keep Swinging! Not a terrible list, but some are very questionable. The Jeter RC, for instance, makes some sense because of the player but that card was hardly “memorable”. I understand that they threw out some rookies just because, but I don’t think that made them memorable topps cards. Now the 1986 Jim Leyland…now we’re talking! How can you argue if this was fan voted. 56 mantle is one of my favs and the 64 rose rightly better than his 63 rc. 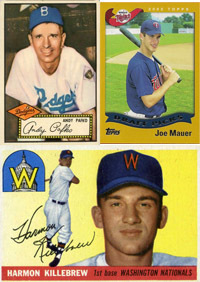 Love the team logos on the 50’s cards and topps colorful designs in 50/60’s. FUN!